AUSTIN ELEMENTARY invites YOU to enjoy a morning of fun at their annual DUNWOODY DASH on November 3rd at 8:30AM. Stay after the race to enjoy complimentary jump houses, obstacle courses, music, food and fun! On-Line registration closed but walk ups are probably available. Click here for more info. The Dunwoody Dash will start at Austin Elementary and run through local neighborhoods. Race Start Time: 8:30 a.m.
Dunwoody Dash Family Sponsorship: All Gold, Platinum, and Diamond Sponsors ($1000 + donors) receive name recognition on shirts. *Option to add your name for a $100 additional donation to registration fees. Optional Grub Grab: Spend $40 for a $50 Gift Card from a local restaurant. Pick up Gift Cards the day you pick up your Race Bag. *Gift Cards quantities limited. 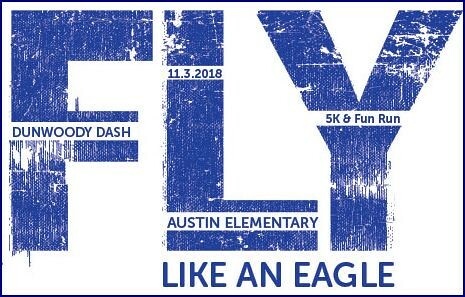 ALL PROCEEDS BENEFIT THE AUSTIN ELEMENTARY EAGLE FOUNDATION/PTO. Time is running out - register for the Dunwoody Dash today!